The sixth Splitgraphic International Graphic Art Biennial took place from October to December 2013. Splitgraphic biennial is showing contemporary international and national graphic artists. Since 2003, when the first Splitgraphic biennial was organized, we have been continually working on presenting international, Croatian and local printmakers; supporting new and classical tendencies in graphic art and above all aiming to exhibit good quality prints. And we have succeeded in doing so in the last ten years: in addition to group exhibitions Splitgraphic organized over ten solo-exhibitions of graphic artists such as Mirko Ilić (2003), Masahiro Fukuda (2005), Vasko Lipovac (2007), Dušan Džamonja (2009), Nevenka Arbanas and Maja Franković (2009), Miroslav Šutej (2007), Kristina Restović and Ivan Kožarić (2005), Brita Weglin (2009), Nikola Skokandić and Janice Wong (2005), Hugo Besard (2011) and Ingrid Ledent (2013). The Spligraphic awards were received by the renowned names in graphic art: Vasko Lipovac, Masahiro Fukuda, Hugo Besard, Yoshio Imamura, Davida Kidd, Basil C. Frank, Nevenka Arbanas and Maja Franković, Mirjana Vodopija, Janice Wong, Brita Weglin, Hishasi Kurachi, Ingrid Ledent, Marta Lech. Idea or concept of the exhibitions during Splitgraphic biennial has changed over the years. The concept of the first Splitgraphic in 2003 was the Diocletian’s palace that was chosen as a continuation of Split’s graphic tradition. We wanted to link Splitgraphic biennial with city’s printmaking history and with the famous and influential book by British architect Robert Adam. He dedicated this book to the architecture of Diocletian’s palace in the eighteenth century, and published it with the engravings made by Charles L. Clérisseau. The second Splitgraphic introduced the theme of dialogue as a fundamental idea that has been since then the underlining thought of all Splitgraphic exhibitions. During second Splitgraphic a series of exhibitions was organized with the concept of dialogue among artists of different artistic genres, printing techniques or even generations: Kristina Restović – Ivan Kožarić (Gallery Of Art Conservation Institute), Sandra Mateljan – Marko Pogačnik (Ethnographic Museum Split), Nikola Skokandić – Janice Wong (Gallery Of Art Conservation Institute), group exhibitions of Italian and Japanese printmakers (The Split City Museum) and Croatian and American photographers (Fotoklub Split). The third Splitgraphic in 2007 was based on an idea of a female printmakers dialogue whose prints made two-thirds of the group exhibition. The Award for Young Artists was founded during the third Splitgraphic. Over the past years we have exhibited, supported and awarded young and unknown Croatian artists and made it one of Splitgraphic’s primary goals. 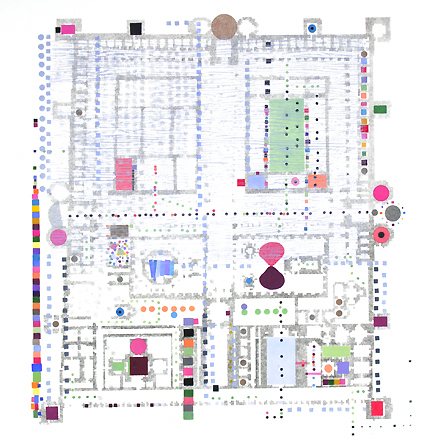 The fourth Splitgraphic in 2009 was developed as a dialogue and confrontation of printing techniques and questioning of graphic media in contemporary artistic tendencies. Apart from the group exhibition we organized three solo exhibitions (Dialogue Nevenka Arbanas and Maja Franković, exhibition of Brita Weglin and the exhibition of Dušan Džamonja). 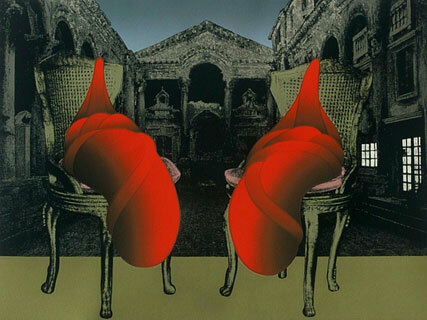 The retrospective exhibition of Dušan Džamonja’s prints and drawings was one of the Splitgraphic’s highest points. Splitgraphic in 2009 was up that moment the largest one, which signifies the importance of the event and the acclaim Splitgraphic gained. Splitgraphic encouraged not only a dialogue among artists and printmaking techniques but also a dialogue of exhibition venues, one of the reasons being that we still lack our own space to work in, and the other the importance of connecting and establishing dialogue among city’s exhibition spaces. By installing exhibitions in various galleries during Splitgraphic biennials we created a dialogue and a connection among city structures “invading” them with graphic art. We had group and solo exhibitions in: Gallery Of Art Conservation Institute, The City Museum Of Split, Ethnographic Museum, Emanuel Vidović Gallery, Old City Hall, Gallery Loggia of POUS, gallery Studio Naranča. Theme or concept of the sixth Splitgraphic was sustainability defined as a capacity to endure and to continue with your activities. Why have we decided on a subject of sustainability and how does it relate to on the sixth Splitgraphic biennial? Sustainability as an idea was reflected upon in two different ways on Splitgraphic – sustainability of the biennial manifestation itself and the sustainability of the graphic art as a medium in contemporary art. Splitgraphic has organised a number of successful group and solo shows of important international graphic artists during its existence and we have established the city of Split as one of the centres for graphic art. As a printmaking biennial that promotes graphic art we are responsible for renewal, support and growth of interest for graphic art in Croatia. Since 2003 when Splitgraphic was founded it has positively influenced the rise of interest for graphic art, questioning of the role of graphic art today, as well as abolishing the understanding that graphic art is only executed in a classical traditional way, but that printmaking is a part modern artistic creation. The idea of organising Splitgraphic, apart from reinventing Split’s cultural scene, connecting with its graphic tradition, for Split has often been the theme in graphic art, was presenting the contemporary graphic art as it exists today. The awarded prints of Marta Lech, Tomiyaki Sakuta, Nicolas Poignon and Edvin Dragičević were produced with traditional graphic techniques, but in a completely contemporary graphic language. Marta Lech draws light nets of lonely known objects that border with abstract in her black linocuts, while in the work of Tomiyaki Sakuta there is absolutely nothing abstract but a visual surreal mastery of details that create completely new images and new worlds inside the same image over and over again, Nicolas Poignon makes lonesome melancholic images of the sky and architecture, and Edvin Dragičević uses closed heavy forms of bunkers and opposes them to light red signs of paper planes. We have chosen and awarded the works that are rooted in contemporaneity, while still containing the basis of classic processes in printmaking. In this we found one possible way of sustainability of graphic art, but we have to say that we still strongly support “new” graphic techniques that is visible in the awarded prints of the young Polish students. With traditional techniques the awarded artist have produced a contemporary work of art. The Belgian artist Ingrid Ledent, Splitgraphic’s solo exhibition in November this year, is doing the same thing in her work. Ledent’s work is the paradigm of contemporary graphic creation. Graphics, that is lithographs in Ledent’s work are a part of installations with video and sound, and their themes are repetitions and multiplications as a basis of graphic art from smallest printed part of the lithography. Ingrid Ledent uses multiplications to question the duration in time of herself as well as of her work. The combination of various mediums like lithography, digital print, video and sound only confirms the flexibility and ability of graphic art to express modernity. Two levels of questioning sustainability – the first concerning graphic art where we think we have proved by selection and installation of prints to be up to the challenges of today, and about the sustainability of Splitgraphic, in the end it is not up to us for we have proved that we are sustainable with our work so far. During the third Splitgraphic the group of artists-students from the Academy of Art in Zagreb was exhibited: Martina Beneta, Iva Čurić, Tanja Kos, Petra Kriletić, Iva Šarić and Maja Pintarić. Petra Kriletić won the Award for Young Artist of the third Splitgraphic biennial. Janice Wong “Dio Boogie-woogie”, oil monotype, Special Award I Splitgraphic 2003.